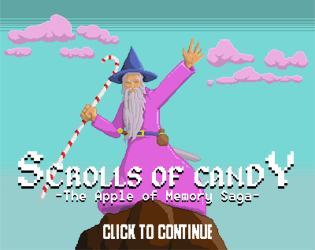 Made especially for #CandyJam: Scrolls of Candy: The Apple of Memory Saga. Scrolls of Candy is a mashup of Bejeweled, Puzzle Fighter and Rock Paper Scissors, set against the soon to be historical drama of King.com's trademark-gate 2014. Assume the role of Candolf, Candy Wizard Extraodinaire, and face off against the best Lawyers the evil King Dotcom can afford in brutal one-on-one matching-puzzle-magic-combat. Can you find the Apple of Memories and restore order in a land where trademark law has gone insane? - When it's your turn, click on one of the candies in the centre of the screen. Players take turns with an computer opponent selecting a type of candy to detonate. Whoever can detonate the most candy in a chain reaction wins the battle, but not the war. Control flips back and forth between players, only the attacker can deal damage. The game is over when one of the player's health reaches zero.